WTF Wednesday! : Lindsay's Modeling Mask Review and FAIL! Today's WTF Wednesday would have been the first WTF Wednesday if I didn't FAIL so hard. I heard about the latest K-Beauty craze which is the Modeling Mask a couple of months ago. I saw the masks advertised in Hermo.my, but I didn't buy them then because of the price. They are around RM8-14 each, which is quite expensive for a single use item (the same reason I don't get on the hydrogel mask hype bandwagon, yet). So when Hermo celebrates their 4th Anniversary a couple of weeks ago and had a crazy sale on these masks (RM1! ), I grabbed them faster than you can curl your eyelashes. They had a policy of only one sale item per customer per day, so I could only get two masks (Calendula and Lavender) from my two orders from them. I of course, researched and prepared for the D-day. Frankly I was so excited and determined to get it right on the first try, that I took an advice on the internet to use all the content at once (because you need the application to be thick). The cup came with a specially designed spatula to even out the application, and the mask is in powder form with tiny bits of orange substance floating around. To use the mask, just add water to the middle line and mix it up to a fairly smooth paste. The mask will look like a cake batter at this point. This was where it went wrong. I was too distracted taking pictures and worrying if I got the right consistency and pushing my cat away from licking my face and the mask that the mask started to harden within 30 seconds and I only managed to get some bits on my face. The rest of the mask hardened in the cup and there were nothing I can do to salvage it. Cue disappointed face of a person who thought she had studied enough but the organic chem exam slayed them still. For the next attempt, I divided the powder mask and only use half of it for safe bets. I pour some water to what I gauge to be halfway from the measuring "line", mix it as fast as I could and pour it all out on my face without really being neat about it. I guess half the fun is being messy with the mask. I managed to get everything on my face and I think I applied them quite thick and even. I waited around 20 minutes, scared my sister when she's walking into the room, and took some pictures. It didn't dry down like a mud/clay mask would but into a rubbery consistency which is actually quite fun to peel off. Overall, my skin does feel a little bit cleaner, smoother and softer after wearing the mask, which makes it a nice treat for a weekly treatment. I guess now I know why it became a trend in Korea. 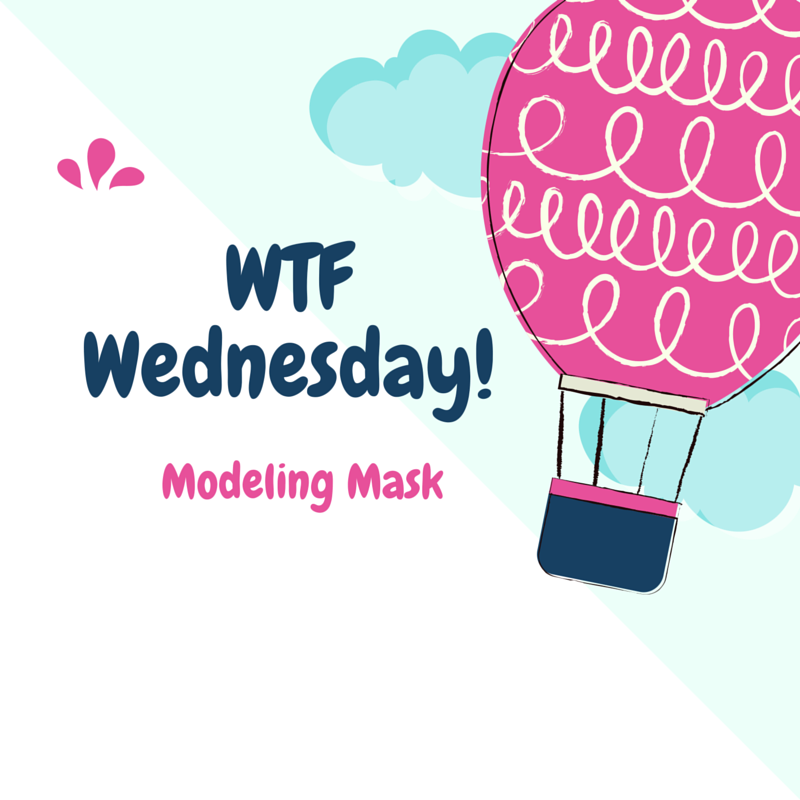 If you don't mind splurging a bit and being a bit messy, read my list of tips while using the mask and give the modeling mask a try! Work with the mask as fast as you can. There is no time for selfies and snapchats! Take pictures after you have them on, trust me! Always a good idea to wear them in the bathroom because it drips everywhere before it sets. Wear a hairband and avoid getting them on your hairline. Peeling the mask when it's not stuck on your hair is easier. Also little bits of dried mask in your hair is not cute and getting them out is quite annoying. Applying them thicker on the edge makes peeling the mask so much easier. Have fun! Getting messy is perfectly fine! So many newstuff from Korea, how do I get to try them all.. hahahah. cos I really want to try all of them! good to see that it is easy to remove after use. looks good there!! hehee, i didn't know masks can harden so quickly. oh well, lesson learnt. Ok thanks for the infor, I shall do it fast so that i will not face the same problem. Lol. This sometimes happen with me also. But need to try one more time and then we actually see the effect. Modeling mask looks very nice, does it remove blackheads as well. wow...looks so good...would like to try it out!! Haha... naughty cat. This is pretty good and affordable too. Interesting mask. Never tried before.